STEP 1: Confirm “Selection System”. Please confrim your appropriate selection system using the chart below. 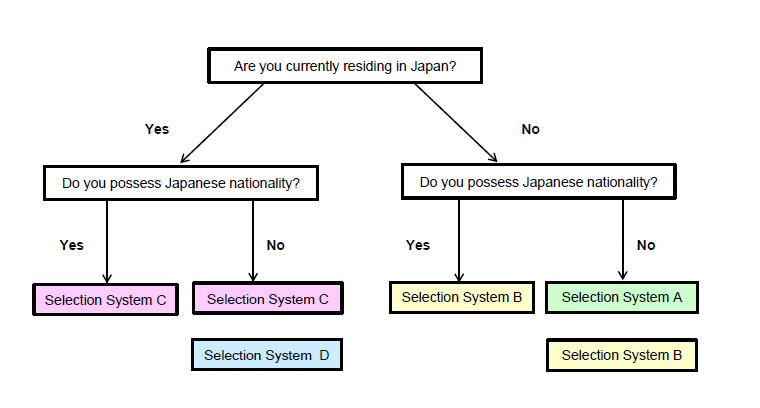 For the detailed information about each selection system, please see the following table. International applicants who reside overseas and take the on-site examination within their own country. STEP 2: Check “Application Eligibility”. Have you received (or expected to receive) 12 years of school education or any equivalent qualification by March 2019? Do you have a sufficiently good command of English? STEP 3: Prepare Application Documents. Prepare all the required documents including personal statements, English proficiency test results and school records etc. STEP 4: Input Application Data into our Internet Application System. For instructions on how to enter the required data into the Internet appliation system, plese refer to the each application guideline. Pay the Entrance Examination Fee (17,000 yen) through our Internet Application System. STEP 5: Send Application Documents through Registration Mail. STEP 6: Receive your Examinee Number. The university will send you an application acceptance notification including the examinee number by postal mail. Send an e-mail to the IGS office (address: igs-application@hiroshima-u.ac.jp) to let us know that you have received the examinee number. Usethe examinee number and name as the subject of the e-mail. STEP 7: Check the Result Notification of the First Selection. Notification will be sent by post and the examinee number of successful applicants will also be published on our website. Arrange the date and venue for the final interview. Successful applicants will be contacted by mail to arrange the date and venue for the final interview. Check the date and venue for the final interview. Information on where to assemble and the time will be provided along with the result notification of the 1st selection. STEP 9: Take the Interview Exam via the Internet or in Hiroshima. STEP 10: Check the Result Notification of the Final Selection. Notification will be sent by post and examinee numbers of successful applicants will also be published on our website. STEP 11: Complete the Admission Procedures within the Designated Period. Admission procedures must be done by postal mail only. Successful applicants will be notified of the detailed admission procedures .